Lion Mountain in the Gravelly Range of southwestern Montana. This area is federal land managed by the U.S. Forest Service. A part of my recent geological field work includes working on high elevation Tertiary strata in the Gravelly Range, southwestern Montana. 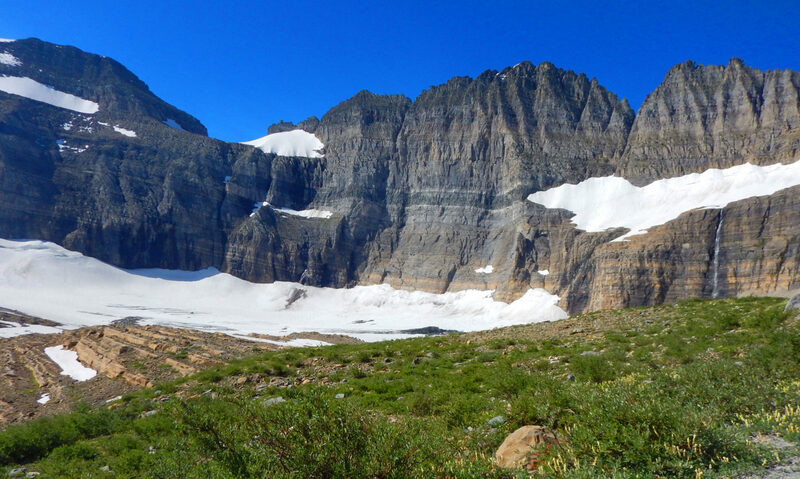 The Gravelly Range is located in southwest Montana, about 10 miles southwest of Ennis, Montana. For some background on this area and what my field work is about, see an older blog that I posted at Geopostings. So – now that one field season is done and field data compiled, both my co-worker, Don Lofgren and myself have interpreted some of our data. We recently outlined our work at the Geological Society of America’s (GSA) Rocky Mountain section meeting in Calgary. Alberta. The abstract from our session is given below as well as the poster itself in both a jpeg format and as a link to our GSA presentation. Black Butte section is Duchesnean-Chadronian based on Harvard Museum of Comparative Zoology collections. Recent collections that include Miohippus indicate a probable Orellan age for uppermost exposures. The Tepee Mountain section is notable for abundant brontothere remains and is probably Duchesnean-Chadronian (approx. 39-33 Ma). The Rapamys site is the oldest vertebrate locality and is late Uintan to early Duchesnean (42-38 Ma) based on recently recovered specimens of Rapamys, Protoreodon, and Lycophocyon. The Tertiary strata in this part of the Gravelly Range include fluvial, aeolian, and tufa deposits that are most likely mainly associated with localized Oligocene volcanism. The Lion Mountain section is about 270 meters in thickness; the lower half of the section is largely aeolian, with fluvial units comprising much of the upper section. Based upon age data, the 140 meter Black Butte section correlates to the lower 50-70 meters of the Lion Mountain section. The basal 20 meters of the Black Butte section contain some fluvial features, but much of the remaining section is largely aeolian in origin. Paleosols and extensive burrowing also occur within the Black Butte section. Stratigraphic section thickness decreases rapidly away from the Black Butte-Lion Mountain area, with section thicknesses of about 20 meters for the largely aeolian Rapamys and Tepee Mountain sections. Tufa deposits are located along the west-central edge of the Gravelly Range where they are associated with previously mapped thrust faults. Leaf imprint assemblages of Eocene-Miocene age are contained within these tufas. Strata previously mapped as Upper Cretaceous-Paleocene Beaverhead Formation are now variously reassigned to the lower Cretaceous Kootenai Formation, southwestern Montana Cenozoic Sequence 2, and diverse Quaternary units.” From: Abstract from Geological Society of America Abstracts with Programs. Vol. 49, No. 5 doi: 10.1130/abs/2017RM-293156. The poster presented at the 2017 Rocky Mountain GSA is available below as a jpeg and at GSA as a pdf. The Gravelly Range is located in southwest Montana, about 10 miles southwest of Ennis, Montana. Much of the range is covered by the Beaverhead-Deerlodge National Forest. The Axolotl Lakes Wilderness Study Area, managed by the Bureau of Land Management, is in the northern part of the Gravelly Range. Gravelly Range – looking east over Paleozoic rocks to the Madison Range in the far distance. Our field group was interested in looking at Tertiary rocks, so we headed for the Black Butte – Lion Mountain area, the more south-central part of the range. A cold front had just swept through western Montana a few days prior to my field trip. That storm left some snow up on the range crest – yep, that’s right, snow in July. But it did melt off fast and it left vegetation along the Gravelly Range road (the main road that stretches along much of the top of the range’s extent) extremely lush. So it was a gorgeous drive from the Lyon Bridge crossing on the Madison River up to Lion Mountain and Black Butte. And as Black Butte is the highest peak in the Gravelly Range at 10,542 feet in elevation, it was not difficult to find our destination. Black Butte, at 10,542 feet in elevation, is the highest peak in the Gravelly Range. Eruptions at Black Butte have a radiometric age date by whole-rock K-Ar of 22.9 Ma. East side of Lion Mountain as seen from Wolverine Basin. Alkaline basalt caps Lion Mountain, and has a K-Ar age date of 30.8 Ma. The Tertiary rocks of interest to us were primarily the Tertiary strata exposed on the west side of Lion Mountain. Fossil fauna from these strata have a North American Land Mammal Age of Whitneyan, and are approximately 29 to 32 million years in age. Carnivore, rodent, insectivore, and rabbit are some of the fauna of the fossil assemblage collected here by past workers. The west side of Lion Mountain with Tertiary strata exposed under the 30.8 Ma basalt cap. It was a good workout to reach the top of Lion Mountain, but really was well worth the effort. The Tertiary strata had plenty of features to keep a sedimentologist like myself busy. And the views – just spectacular! To top off the trip – it was obvious that someone had been there before us because we found an aluminum ladder stashed is the trees near the top of the Tertiary exposures. None of us availed ourselves of its use, but maybe next time it will come in handy! A ladder is stashed in the trees near the top of Lion Mountain. The Snowcrest Range is shown in the distance on the left hand side of the photo. Black Butte pops over the ridge in the photo’s upper right.